As per my previous blog post Microsoft has release MS14-025 that blocks the ability to configure passwords using Group Policy Preferences. However as part of the guidance they have also published a PowerShell script that allows you to set a random password to the user local admin account. This blog post show you how you can use this script (bad word, I know) to manage the passwords of local accounts on the computers in your organisation. But, if you are using local admin accounts on your workstations then the following will give you an alternative to using the now disabled password feature in Group Policy Preferences. The PowerShell script that Microsoft provides generates a unique random password for each compute so it’s also a mitigation step against a Pass-the-Hash attacks. This is a nice side affect of setting a unique password as you cannot use the hash of one local admin account to access another computer. Simply put, this PowerShell script contacts each computer over the network from a pre-defined list and then set the local account password to a random value. Note: Because the computer’s need to be turned on for it to reset the passwords so you may have to perform this process on a regular basis to ensure that you cover all computers. Next, it then saves this password to a file that can/should be encrypted with a “master password” of your choosing. This is of course necessary to give added protection against anyone that “might” grab a copy of the password file as it means they would also have to know the encryption password to decrypt the password value. 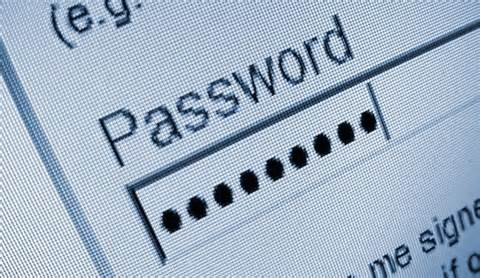 Saving the password in a text file might not sound all that secure however it is a lot more secure than using Group Policy Preferences. Recap: Group Policy Preferences saves the “cPassword” value in Active Directory System Volume in files that are readable by all users and with the same 32bit encryption password. Warning: While this script is from Microsoft it clearly states that in no way shape or form is it actually support so the following is to be used at your own risk. (See MS14-025 for further disclaimers). As I said before this PowerShell script actually makes a connection to each computer you first need to enable WinRM on all the computers that you are changing the password on. To do this take a look at my previous post How to enable WinRM via Group Policy and ensure that it is applied to your computers. 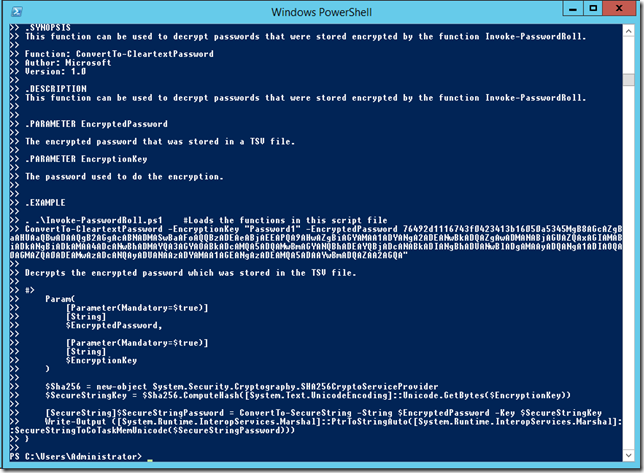 You have now created the require functions in that current PowerShell window to perform the password change process. You will need to do this each time you open a new PowerShell Window as the command are not persistent. This might be a little convoluted but doing it this way also removes the need to enable unrestricted or bypass of script signature checking. The next step is to generate an up to date list of computer names in a text file for the script to process though with the password change. Invoke-PasswordRoll -ComputerName (Get-Content ComputerList.txt) -LocalAccounts Administrator -EncryptionKey "[email protected]" -PasswordLength 22 -TsvFileName "LocalAdminPasswords.tsv"
Of course you should use your own unique Encryption Key to encrypt the password value. Tip: Don’t forget the password!!!!! As you can see the script will also warn you when there is other local accounts on the computer that is not affected by this script. The script will append to the “LocalAdminPasswords.tsv” file is as follow, this means that the last password value on the list for that computer name is the valid encrypted password. Now when you want to retrieve the password for that account you need to copy the corresponding “EncryptePassword” value and then run it through the “ConvertTo-CleartextPassword” command. Tip: Be sure that the encryption key matched the value you used in the “Invoke-PasswordRoll“ command above. As highlighted below is the unique 22 character random password for the local admin account on the corresponding computer that you can now use to logon to the computer. Now that you have an alternative to the passwords in Group Policy Preferences be sure that the file is save in secure location and that you also periodically run the script. While this is no where near as easy as using Group Policy Preferences this is definitely are far more secure way to mange the local admin passwords on your computers. But as I mentioned above, if you can, its far better to disable all the local admin accounts entirely on your computers as this will be more secure and easier to manage. I have done this before, after I found, that users could read the password set via GPO in clear text in the registry or with Group Policy tools. 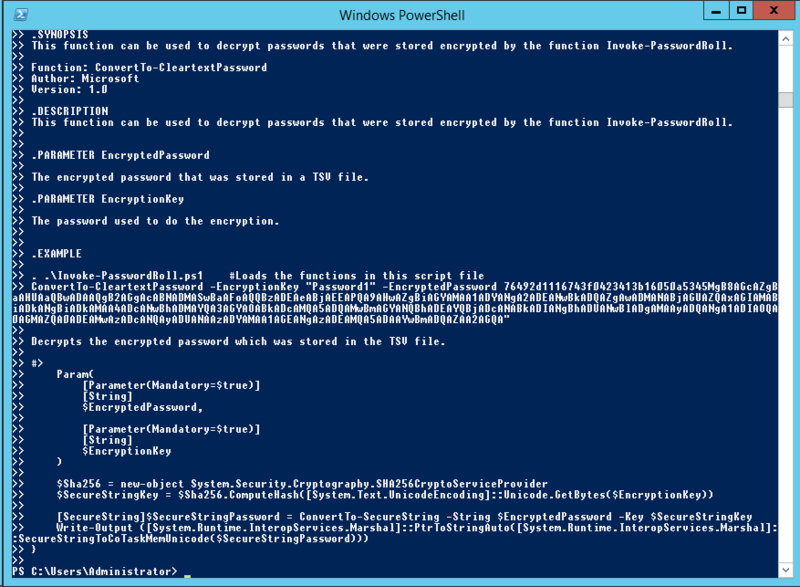 Encrypted the password, put the encrypted key into a text file and used a PowerShell script to assign the password during computer shutdown. For increased security you can put the text file containing the encrypted password on a network share with regulated access (read access only necessary for Domain computers and the administrative person, who needs to change that file for a new one from time to time). + Invoke-PasswordRoll <<<< -ComputerName (Get-Content C:\ComputerList.txt) -LocalAccounts Manageitinfy -EncryptionKey "[email protected]" -PasswordLength 22 -TsvFileName "LocalAdminPasswords.tsv"
How does this work with GPO scheduled tasks? To bad what I really need to do is Set the local admin password to a specific password and change it as we see fit. How do we do that now that the GPO has been 86’d? 2. Copy this file to a shared folder, which each machine can read (and each user cannot for improved security). I got the following error and the default Administrator Password did get reset though. However , you don’t see the encrypted password in the output .tsv file. ConvertFrom-SecureString : Exception has been thrown by the target of an invocation. Could anyone give me a hint here? Hi all. I appreciate all the help from Alan and the other commenters. Here is a slightly tweaked version of MS’ script. It just changes the output order so the target computer is listed before the password, so it is easier to combine output from later runs and sort alphabetically, and it also adds a command at the end to mark extensionAttribute3 on the computer accounts in the tsv file (pwds successfully reset) so you can skip those computers on subsequent runs. #This is here so I can record what the server name that the script connected to was, sometimes the DNS records get messed up, it can be nice to have this. # on the client running the script ensures only 1 computer needs the full .NET runtime installed (as opposed to every system having the password rolled). Here is the batch I am running in case it is helpful to anyone else. It needs work but has gotten us moving. @echo Attempt to roll passwords, outputing passwords to TSV. Script is domain specific so we can specify DC to use for marking extensionAttribute3 to AdminReset. YES… LAPS is way better. I will be talking about that next week at Ignite NZ. Having completed the process of rolling the passwords could someone help me locate where the TSV file is?